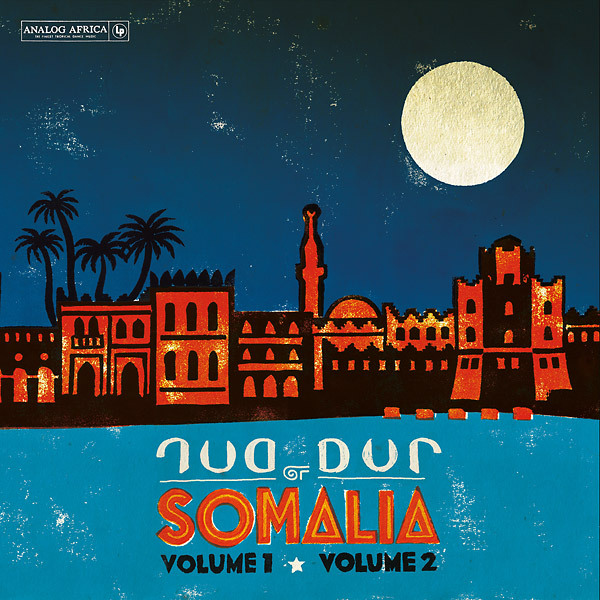 Five years ago, Awesome Tapes From Africa introduced the rest of the world to the Dur-Dur Band, a supremely danceable combo from 1980’s Somalia that brought together disco, funk and local rhythms from the Horn of Africa; four distinctive singers backed by a well-drilled seven-piece ensemble. Now Analog Africa (AA) has gone directly to Mogadishu (the first cratedigging trip I’ve heard of where an armed guard was required) and come back with some of Dur-Dur’s original master tapes. AA is preparing a series of three Dur-Dur releases; this is the first of them, the band’s initial two cassettes from 1985-7 plus two never-released songs. Afro-funk was the style that turned on the first wave of African cratediggers – for a while it seemed all of it had been mined, but check out tracks 1, 2, 4 and 6 for proof that there’s still Afro-funk gold in them thar hills. 18 is a soulful Ethiopian-sounding excursion with plenty of room for spacy keyboard solos and drum breaks. And 14 is remarkable: it’s in the northern Somalian Dhaanto rhythm that sounds to our ears like reggae. Literally every song here is worth hearing and playing. Don’t miss this one.